Happy New Year! It’s hard to believe that 2017 is already here. In the past, we’ve made an annual tradition of listing some of our favorite reads of the year before the holidays begin. But this season, as we find ourselves staring down the barrel of a year that promises to hold significant changes for our nation with a mixture of apprehension and resolve, we’ve decided to do things a little differently. And so, rather than a list of holiday reading recommendations, here are a few books by some of LR’s friends and past contributors that inspired us in 2016 and that we hope will inspire you to take heart, to speak up, to fight harder, and to dream and make art with even greater passion in the coming year. We are so proud to have published an excerpt of the manuscript that eventually became this collection in our sixth issue. In Power Made Us Swoon, Saito uses persona to probe family legacies of trauma, immersing herself in the history of Japanese American internment during WW II. Saito’s speaker is transitory, transcendent in the resolve that propels her to continually return to the artifacts of memory, and to inhabit sites and stories in search of narrative, lyric, image. In a time when more than one public figure has attempted to erase the trauma of internment in service of grotesquely racist and xenophobic rhetoric, this powerful collection seems prescient indeed. A finalist for the National Book Award, Sharif’s Look captures the anxieties of our time, illuminating the frightful spectre of language mutated in the mouth of war. The collection recasts terms from the Department of Defense’s Dictionary of Military and Associated Terms to perform a kind of documentary acrobatics that shows how language and experience are imbricated in times of war. “I am attempting my own // mythmaking,” Sharif says, in an elegant, urgent argument about how the private and public, the immigrant and emigrant, and the civilian and military are realities that cast shadows, chiaroscuro-like, on each other. One of the first poets whose work we published, Ocean Vuong has a distinctly masterful voice that sings and flits through this finely-tuned collection. At once delicately intimate and intensely raw, Night Sky with Exit Wounds powerfully stitches together—no, choreographs—feathered fragments of memory and the legacies of war and displacement onto a document of the speaker’s coming-of-age journey, a rich odyssey of survival and self-discovery as seen through the lens of language and text. In the context of the troubling conversations about refugees that have swirled to fever pitch of late, Vuong’s singular voice rises to bear poignant, timely witness. “I’m that person who can’t stop looking,” Wong writes, and indeed, hers is the writing of an eye—or an “I”—that is attuned and attentive, a poetry startled into mystery, one into which perception floods, impressions overlaid and juxtaposed to encapsulate everything from the cosmic to the kitchen. The language in Overpour is filled with riddles and slips, steeped in undergrowth, and inhabited by mushrooms, carnations, and sweaters. The poems are songs, tasting the strangeness of language, its slippages and shifts in meaning, and embedded music. We hope that 2017 is a year filled with brighter things for our community, despite all apparent expectation—glimmers of illumination in the midst of struggle, moments of delight that surprise us in the thick of the ever-present work. As you labor on, may these books, and the many others like them (c.f. 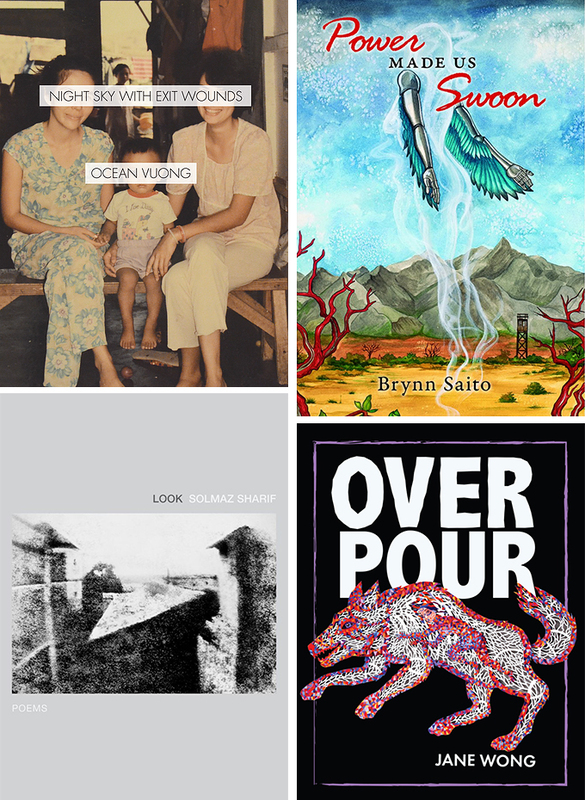 also Bryan Thao Worra’s extensive roundup of books by API poets published in 2016, and Hyphen magazine’s 2016 poetry favorites), be touchstones to you. Return to them when the work feels weary; keep their words and images pressed to your skin like small talismans kept in a coat pocket, warm and smooth to the touch. May language serve you well this year, and may your own words in turn be infused with strength and truth and beauty, lantern-glow against the ever-quickening dark as we stride into the months ahead.